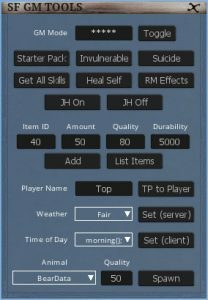 A toolset for Life is Feudal that provides all of the most common GM commands, in the touch of a button. Last edited by Skunkfuapps on 09 Dec 2018, 17:40, edited 6 times in total. Nice tool but worked only once for me after execution through console, must be x64 problem. This tool is very helpful, thank you! Could you add a FogPostFx.disable() FogPostFx.enable() button to toggle the fog on and off with a simple click? S1l3N7671 wrote: This tool is very helpful, thank you! Hi.....there is a button for fog if you use the SF-Mod, too ( http://skunkfu.net/sf-mods/ )..... Look at "Graphics"
Halvar_Keltison wrote: Hi.....there is a button for fog if you use the SF-Mod, too ( http://skunkfu.net/sf-mods/ )..... Look at "Graphics"
Thank you, it worked perfectly and it keeps the fog off even when i relog.